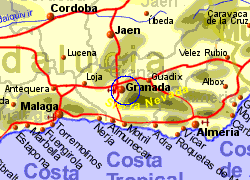 The large village of Gojar sits 800m above sea level, overlooked by the Sierra Nevada, in an area known as Vega de Granada, approximately 6Km south of Granada city and 50Km from the Costa Tropical coastline. The village has a 16th century church but is mostly quite modern, being within easy comuting distance of the city. 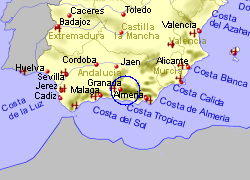 The surrounding areas to the to the south, east, and west (away from the city) are agricultural, mostly growing olives. Gojar has a selection of shops (including a supermarket), banks, bars and restaurants. 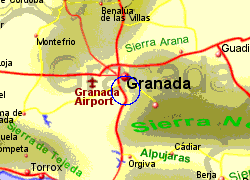 Map of the Gojar area.